Today, we drove from Kailua-Kona to South Point and beyond. Pass the zebra , donkey, and buffalo. 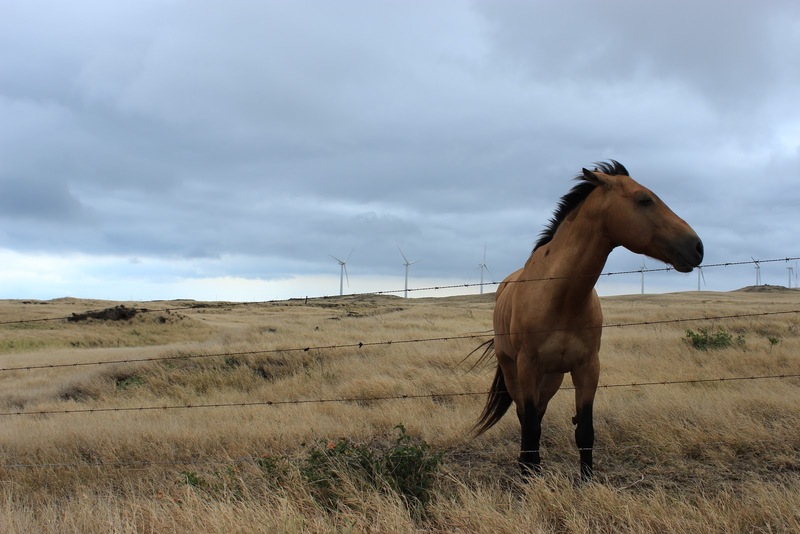 Pass the horses and windmills. We stood on the cliffs at the most southern point of the US. With it’s strange gallows like contraptions, whose block and tackles once lowered boats to the sea. Then on into the wind. Passes white caps on blue water, and green plants with yellow flowers hug red earth on black lava. It was a nice birthday trip. We saw beautiful scenery, and only a handful of people. 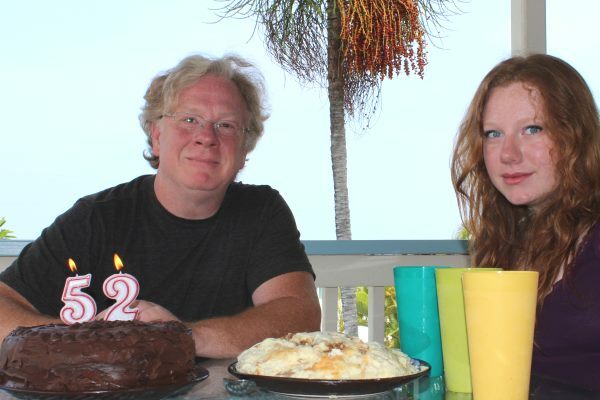 Bill's Birthday: This is the first cakes Rachel has ever made from scratch. June 16. Bill's 52 Birthday! It seems like whenever we want to cook it always entails a search of the cabinets and the pantry, then a trip to one or more stores. The planning for Bill's birthday cake was no exception. The prep took three days. Day 1: Rachel searched internet, chose recipes, made a shopping list. Day 2: Two hours shopping at two stores, plus drive time. Day 3: A full day of cooking for Rachel. Third trip to store for candles. Day 4: Today. Finally time to taste! Rachel wanted to make a New York cheese cake and a dark-chocolate cake with ganache frosting from scratch for Bill's 52nd birthday. She found recipes on Martha Stuart's website she wanted to try. Since everything including the hand mixer, spring-form pans, and every ingredient had to be purchased at Hawaii prices, we figured this would be Bill’s most expensive birthday cakes ever. I tried to talk Rachel into going out for dinner and buying a cake, because it would have been cheaper, but she wouldn't bite. We bought most the ingredients at Wal-Mart and the hand mixer and spring-form cake pans at Target. Rachel made this classic cheese cake recipe, and we laughed that it looked like birthday mashed potatoes. Being frugal, instead of getting two additional pans for the chocolate cake, we just purchased a second spring-form pan. She made the cheese cake first. The cheese cake takes a day in the fridge to set up, and she needed the pan to bake the cake. So what looks like mashed potatoes is a huge plate of delicious cheese cake. Potatoes are expensive here, both at the store and the farmers' market, so we haven't purchased any yet. I told Rachel, we should learn to love papayas which were 9 for $2 at the farmers market! Eat what is local and in season, but we don't really like papayas. My favorite produce comes from the small family farms. They have an unmanned table by their gate with fresh produce and the price. You take what you want and leave the cash. Prices are better, and all the money goes to the farmer. While it looks like the booths in the farmers markets purchase from local farmers and from big produce suppliers. One time we bought mushrooms at the farmers market, they came from a packer/distributor in Canada who was selling mushrooms grown in the state of Washington. They were good mushrooms, but probably the same ones we could have purchased at the grocery store here or in Texas. The farmers market seem to try to have everything to keep buyers from having to go to the store. We had a slice of chocolate birthday cake for breakfast, and headed out for the day. We went to Pebble Beach, Black Sands Beach, and the most southern point in the United States. In Key West, Florida last summer we saw them crop dusting insecticide over the city for mosquitoes. My guess is they may do the same thing here. 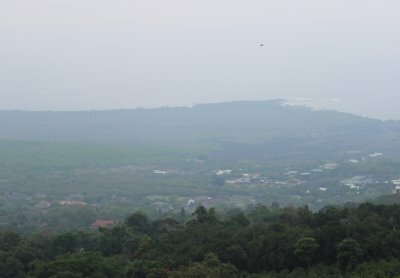 I wonder if the vog and with its sulfur dioxide that is a problem for people is also a problem for mosquitoes. "...after a rigid series of experimental tests Rosenau of the US Public Health and Marine Hospital Service concludes that sulphur dioxide is unexcelled as an insecticide. He shows that very dilute atmospheres of the gas will quickly kill mosquitoes and that it is quite as efficacious when dry as when moist He shows that it has surprising power of penetrating through clothing and fabrics and that it will kill mosquitoes even when hidden under four layers of toweling in one hour's time and with very dilute proportions." I don't think it is unreasonable to suspect that the vog would have a negative effect on mosquito population. Negative for them, positive for us. Just don't tell anyone or someone will want to do a million-dollar government study to determine if that is true so they can put a positive spin on the vog. We've seen people wearing tanks on their backs and spraying herbicide, and we've seen medium-sized tanker trucks with a guy hanging off the back spraying herbicide. On the curbside of family farms and yards, It is common to see hand-painted signs, asking that their plants not be sprayed. I've heard some farmers here say that herbicides were meant to kill plants not people, so there isn't a problem. Some even advertise their coffee as insecticide free. These people are old enough to remember Agent Orange. I wish they would simply search the internet for "herbicide poisoning." I think it would be very difficult to grow organically here, yet there are some farms selling organic produce. 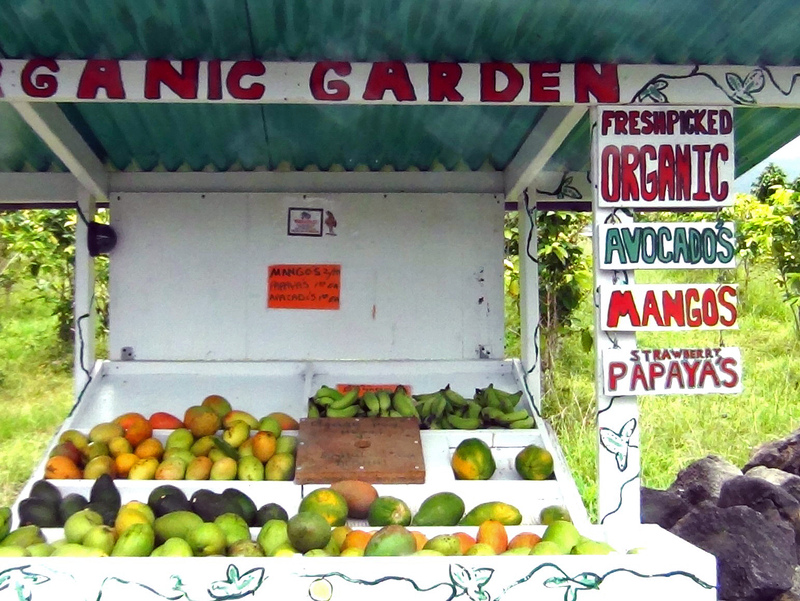 When we go to our favorite snorkel spot at Keoneele Cove or when going to see The Painted Church, we make a point of visiting our favorite organic produce stand Mary's Organic Garden..
*Added note: We found that the jungle areas definitely have lots of mosquitoes! June 14, Thursday: Today I’ve been writing. Bill’s been working on videos and photos this morning, so we were here when more of the packages that we mailed ourselves arrived. I think there are only a couple more boxes coming. We should have labeled what was in each box, so that we only had to open them if we needed something. We should have also kept track of exactly how many boxes we sent ourselves, so we'd know if we were missing any. Too many should haves and not enough time, besides the boxes were organized by how things fit best, not logical use, and things were shuffled a few times, so labeling is better in theory than in practice. We mailed ourselves boxes using the US Postal Service using their priority, flat-rate boxes, and parcel post; even though it was only $20 for the first three bags per passenger on Alaska Airlines and $50 for each bag their after. There is a limit to how much, each person was willing to tote in and out of the airport, even with the help of valets. It is more difficult when you're responsible for a pet, a child, your valuables in your carry-on luggage, etc. By mailing them, we could also insure things for their actual value, which is great if you plan it so that the mail arrives after you do, because you have a time limit to make a claim on the contents of your package. It gave us more room when we only had one vehicle. We would have had to buy extra boxes or luggage to take them on the plane. We packed like things together into a fabric grocery bags. It was important to have the bags look unique when possible. For example: We packed all the dogs stuff into a red Target bag. That way we just had to look for the red, dog-stuff bag to find what we needed. We could then put that bag into a suitcase or a box when it was time to pack again, or if going a short distance we could just throw them in the car as is; and they were easier than boxes because they had handles. Fabric insulated coolers make cheap luggage. We continued to use it for it's intended purpose once we arrive at our destination. We have one that we purchased at Trader Joe's in California that traveled to Florida then back to California and is now in Hawaii. I've seen them for sell at Trader Joe's for $6.99. I've always loved Rubbermaid boxes, because they last and keep the things inside dry. They were great for keeping things dry in the back of the car, and they have handles. We even used one as luggage to Hawaii. For smaller items we packed them into gallon-sized, Ziploc freezer bags. Freezer bags are heavier, so they last longer than regular bags. Clear bags make it easy to see what we needed without opening the bag, and we didn't have to label the bag to know the contents. Having sealed plastic bags was great when we traveled from a low elevation to a higher one. If the expanding air caused a top of a lotion bottle to come off, then the mess was contained to the bag. The last one reminds me of the time I went with the Sunset High School band to Oregon to march in the Rose Festival. I had a small, glass bottle of citronella oil, which I brought along to "confuse" mosquitoes. The bottle leaked during the plane ride, and all my clothes smelled like citronella the whole trip. No bites, though. It is only 1 p.m. but the sky, which started out sunny today, is already overcast; and the ocean horizon is a blur. It would get depressing, so I need to get my face in the water where you don’t notice if it is sunny, cloudy, rainy, or voggy. For more thoughts on Kona Mosquitoes read here. June 12, Tuesday, Rachel slept late, and Bill and I went to snorkel. 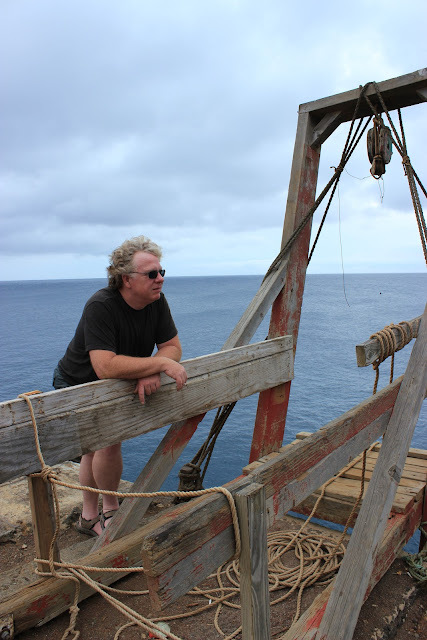 At our regular place, Kahaulao Bay, in the Kona area of Hawaii, the surge was just too violent. Bill tried it, but I wouldn't get in the water. We found another beach area, but it was filled with boogie boarders and people who wanted to play in the surf. Bill went in, but I twisted my ankle on the lava rocks and decide to wait it out on the shore. I smiled to think that I was probably doing something more dangerous by lying under a coconut tree than Bill was snorkeling in the surf. We ate a good lunch at Huggo's. The floor of the restaurant was sand and ironically the most sand we'd been on since we'd been here, everything else had been lava. We then picked up Rachel and dogs and went back to the place we now call the “manta ray place,” but the waves were too violent again. So we drove a little further south. Since it was late it was cool enough that I could sit with the dogs in the car, while Rachel and Bill snorkeled at Keoneele Cove next to the Place of Refuge. They entered the water by walking down the boat ramp. There were two turtles enjoying the cool shallows. Where a cool-water springs enters the cove and mixes with the warm salt water it gets difficult to see. They swam into the bay where the snorkeling was good. Then Bill stayed with the dogs, while I snorkeled with Rachel. There were lots of fish and a notices not to bother the pod of spinner dolphins who call the bay home. Yea, we’d finally found a place to snorkel with easy entrance, and there might be a chance to swim with dolphins! The Painted Church, in Captain Cook, Hawaii is a must stop. Built in 1898 and painted from 1899 to around 1904 by is definitely worthy of a trip. Our favorite part was the painting of the arches. The church is an easy drive on one of my favorite streets simply called Painted Church Road. Photos are from our visit on June 12, 2012. Ceiling over the choir loft. Our favorite painting was above the alter area. If you go, read the history on their website, so you can spend your time looking at the paintings while you're there. Read the history of the Painted Church and get directions here. It is open for viewing during the day. You'll want to take cash or check for a donation while you're there, but it isn't required. According to the website, there is a small museum of Hawaiiana at the rear of the Parish Hall across the parking lot, and two cemeteries at the far side of the church worth a visit. June 11, Monday: The next morning we awoke to a blue sky for the first time. We met the owner of the vacation rental where we are staying. 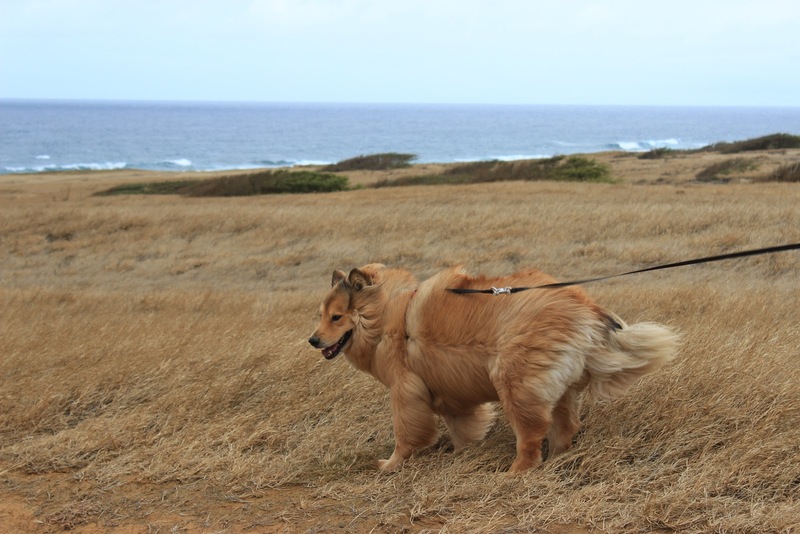 The owners are from Texas, but they spend the summers in Hawaii. We were living in their summer home and they were staying in their timeshare. He had come by to fix a living-room, window blind. We told him not to bother if he was fixing it just for us, since we never intend to lower the blinds. We didn’t tell him that we’d lived at our Texas house on Mahalo for over three years without blinds and curtains except in the bathrooms. We had purchased drapes, but didn’t install them. We finally put up curtains in our bedroom the morning of Eric and Chrystina’s wedding, so the bride could dress without an audience. 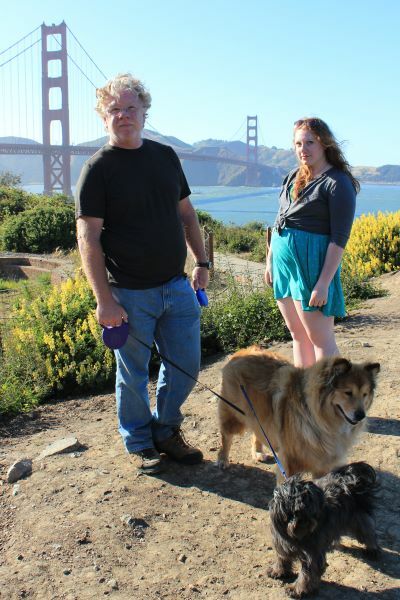 I miss that house, the privacy, the quiet, and Eric and Chrystina. The house where we are now is in the middle of a typical neighborhood on the west side of the Big Island of Hawaii. We can watch hula lessons in front of a house down the street. No one needs or uses air-conditioning. Our neighbors’ parties, conversations, fights, music, televisions, laughing and crying children, and dogs are all clearly heard along with the birds and waves. Our dogs have not become accustomed to the sight and sound of dogs running loose, kids on bikes, walkers, and joggers. Hopefully our dogs will stop telling us about the neighborhood activity soon. We’re trying to teach them not to bark when the other dogs are barking, which is all too often. There are two dogs and a cat living below us. They are friendly and not the barkers, but Frisky freaks out every time he sees them, especially when they are standing right outside the glass door, so we can’t leave the dogs alone at the house yet. Frisky on the Balcony with burrs from the yard where we're staying. Quite a contrast, the first three days in Kailua-Kona were very gray and overcast with volcanic smog. The ocean was gray with no obvious horizon, the water just blurred into the sky. It was much worse than the haze of L.A. We'd read about vog but really were not prepared for it. We didn't know how much we'd miss the sun. There was no rain, but just enough clouds to hold the vog down. Bill and I had headaches, and at times my throat burns. June 10: On Sunday, our fourth day here, we drove to the north end of the island to see sun. We hoped our headaches would improve. Rachel fell asleep in the car on the drive north. She woke up to blue skies, turquoise water, and emerald green grass. She said with a sigh of relief, "It's beautiful here." We agreed. We were in the middle of the cattle ranches. It looked like spring in Texas, with the added views of a blue ocean and what we thought was a distant mountain that turned out to be the island of Maui. We stopped to take a picture of a rainbow. There must be sun to create a rainbow and we appreciated both. 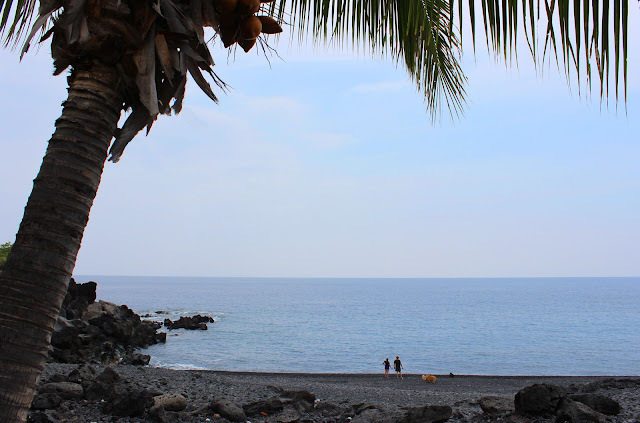 We hadn't seen the sun for three days on the west side of the Island in the Kailua-Kona, Captain Cook, and South Kona regions. I think we stopped at every ocean-side park on our way north. On the way we got better at recognizing the no dog signs from a distance. Still there were some places where we parked and had the dogs out of the van before we found their no-dog sign. Pets aren't allow in any of the county parks. In Kapaau in the Kohala district we drove down Old Kohala Mill Road. According to the Garmin GPS it looked like a road to the coast. It quickly became a single-lane road, then dirt walls on both sides got higher and closer leaving us no place to turn around, so we continued forward. The walls dropped away, but the plants still hemmed us in. We passed a gate with a sign which read, "Do not block. Emergency vehicle access." It was difficult to imagine anything other than a helicopter getting here quickly. We continued about 300 feet more before Bill decided the road was so bad as not be able to continue further, which was something Rachel and I had been saying for ten minutes. Bill backed the van back up the road to the gate with the sign, so he could turn the van around. Then we slowly drove back to find the restaurant with the "vegetarian-food" sign. It was closed and, as it was getting late on Sunday, so was everything else. 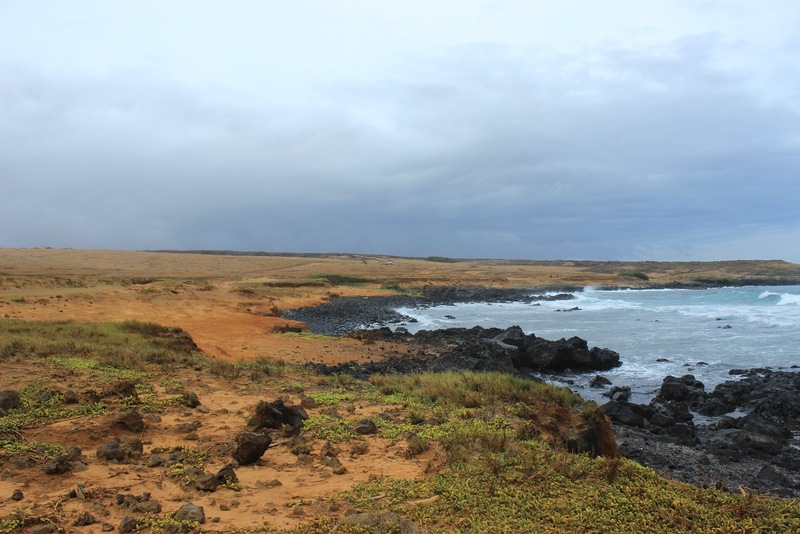 In Kohala we found great sun, double rainbows, clear weather, and sparkling blue skies, but not a place to enter the water when you have a dog with you. We drove south toward Waimea and could see the observatories at the summit of Mauna Kea. What was most amazing wasn't that we could see the distant white buildings on the volcanos rim, but the fact that we could see the volcano at all. This was the first time since we landed that we'd been able to see very far inland. We stopped at a restaurant with just average food. The Hawaiian singer playing guitar and doing covers of country songs and 70s music made the meal much more enjoyable. We stayed late enough to see the stars on the drive home. It was only then I realized we'd not seen stars or moon since we'd been here. I dreaded heading back to the gray gloom that had encased us for the last three days. It had been sunnier in northwest New Mexico in November, the Rocky Mountains of Colorado in December, and the Sierra Mountains in California from January to April and everywhere in California in May; even in San Francisco that is known for being foggy and L.A. which is known for being smoggy. 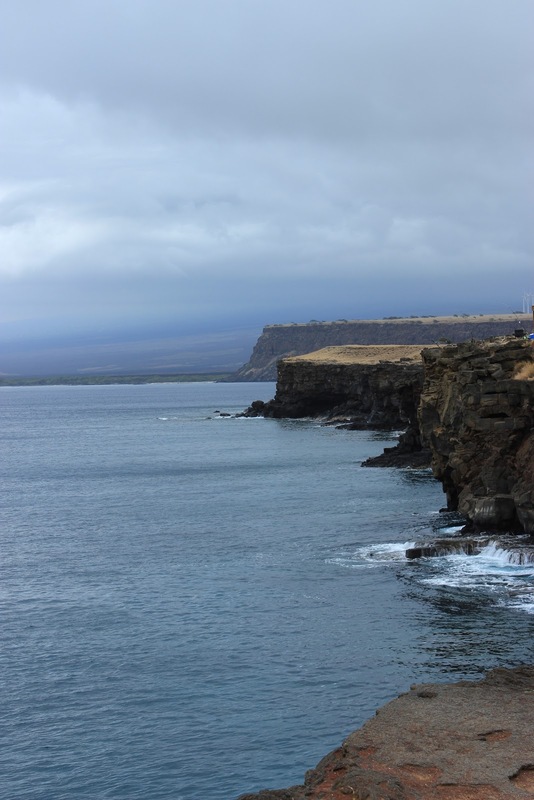 We’d come to an island in the Pacific for sunshine and warmth, but had only found warmth until we headed north to the windy point of the Kohala district. We'd avoided the rain by staying on the west side of the Big Island, but the vog builds up throughout the days, looking like a rainstorm approaching, but it doesn't bring rain, just gray dreary skies, and sulfur dioxide and (according to one national air quality alert websites) 254 days a year of unhealthy-to-breathe air. June 9, Saturday: We went to the farmers’ market in town. Good food and there were crafts, but it was not as fun as the markets we had been to in Kauai which were beautiful with lots of smiling venders offering tastes and tidbits. We spent most the day looking for another place to get into the water, with an easier entrance and exit, and where we could have the dogs with us. We did not find one, so we went back to the place we had been the afternoon before. I was sitting on three reed mats on top of the sharp rocks again holding the dog leashes while Bill and Rachel were snorkeling. It was about 4:30 p.m. and I saw splashes and a large fin. It was headed toward them. I yelled and signaled for them to get out of the water. Their hurry to get out quickly caused Bill and Rachel to get scratched and a little bruised climbing out. Out of the water. Now! I explained that it was either a dolphin fin or a shark fin, but until I knew for sure which, I wanted them on land. They watched the water with me. As we watched the water, a large turtle swam close enough to us that we could see the expression in his dark eyes. It was the first turtle we'd seen in Hawaii this trip. Rachel said, "Mom, we could have been swimming with turtles!" Then they saw what I had seen: multiple little fins splashing, and a then a large dorsal fin broke the surface. They understood immediately why I had been so insistent that they get out of the water. Another group of fins splashing a little further away. We decided it couldn't be pods of dolphins, because we never saw them come up to breathe. Finally one group came close enough that we could make out what it was. It was a manta ray. The splashing, that I thought was multiple animals, was simply his wings coming out of the water and the waves braking over his large body. When he dove, there was the shark-imitating dorsal fin we'd seen. Rachel said, "Oh my gosh! 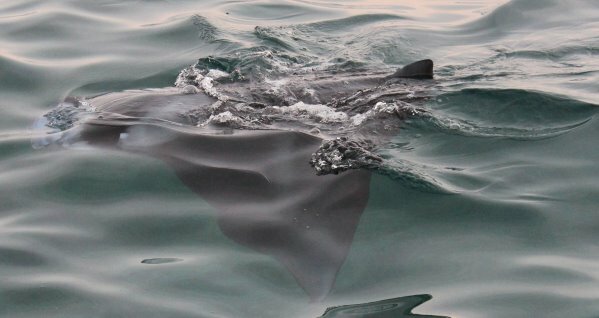 We could have been swimming with manta rays!" So, they did. They climbed back into the water. I acted as spotter and pointed out the direction of the ray. They swam towards a manta ray as it swam towards them, much to the horror of the people in the next inlet who were yelling to them about the shark. Wish we had the underwater camera set up. The manta ray was very much the highlight of the trip so far.